Fishing is not a big part of the Dutch economy: its gross added value is less than a percent of Dutch GDP. But it appeals to the Dutch psyche. One of the most iconic species in this respect is herring: the Dutch have a strange pride in eating it raw, holding it by its tail. One of the most important traded goods in the days of the Hanseatic League, it made some traders in towns like Deventer filthy rich. Alas, nowadays the herring fishery is dominated by the Norwegians. But go to any market in a Dutch town and you will find a stall with the essential raw herring, kibbelingen (originally fried cod cheeks, but it can be any fish species nowadays – a lot of Dutch people think it’s a species of its own) or other seafood. 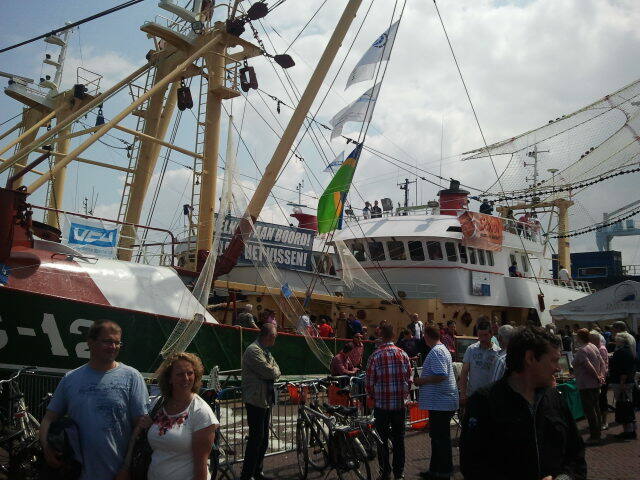 And where better to eat your fish than at the Visserijdagen on Urk? That’s right: on Urk – it’s a former island that is now a town in the Flevopolder. It’s a fascinating place. When the Dutch built the Afsluitdijk and the Zuiderzee became the IJssel Lake, the Urkers simply refused to go the same way as towns like Elburg and Spakenburg, where the old Zuiderzee fishery is no more than folklore. Instead, they moved their efforts to the North Sea and continue to have a thriving fishing community to this day. It’s by far the Netherlands’ biggest fishing community and auction, but most of the Urk fishing fleet lies more than an hour’s drive away in the Frisian town of Harlingen. Like most of the Dutch fishing fleet, the Urk fishery is mostly focused on flatfish like plaice and sole, which they catch by bottom trawlers. As far as I can judge these species are fairly well-managed, although the sector has its share of problems including high fuel prices and growing criticism from environmental organisations at the impact of fishing on the benthic ecosystem. The fuel use and benthic impact go hand in hand: so far the most widely used fishing gear is the beam trawl, which is a fairly heavy piece of equipment that includes so-called tickler chains to stir up the flatfish. It takes a lot of energy to drive the beam trawl over the sea bottom, and biologists argue that it also affects many other species. Therefore, fishers and researchers are currently doing a lot of technical research on alternative gear with lower fuel use and benthic impact. 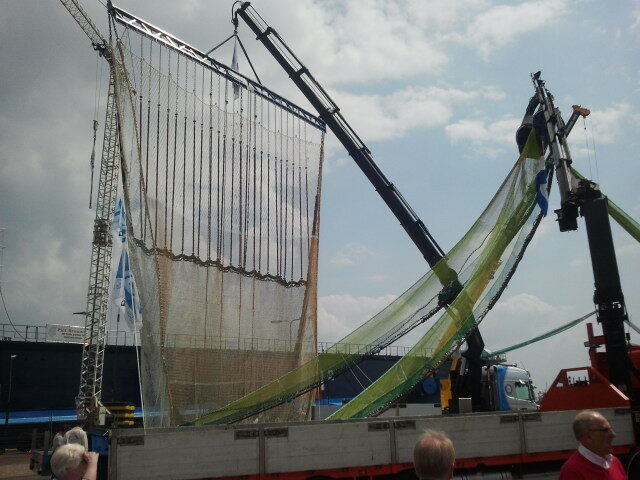 One of these is the pulse trawl, which sends light electrical pulses that have the same effect as the tickler chains on flatfish, but have a much smaller impact on the sea bottom. They had one of those displayed in the harbour. A day like this attracts a lot of people, and I’m sure the weather helped. Or maybe it was the free bag of fish: this is The Netherlands, after all.